Mad Max is not, strictly speaking, an amazing game. It’s certainly not on the same level as The Greatest Stealth Action Game Of All Time: A Hideo Kojima Game And Don’t You Goddamn Forget It. It’s got harpoons, and cars grinding all up on each other, and a very angry man who gets even angrier the more he punches people. There is very little pretense; Max needs to get to a series of places, and he’s gotta make his car better in order to do so. This leads to lots of scrap collecting and busywork. That’s pretty much The Whole Thing. You may have heard some people say that it gets repetitive quickly. They are not wrong. 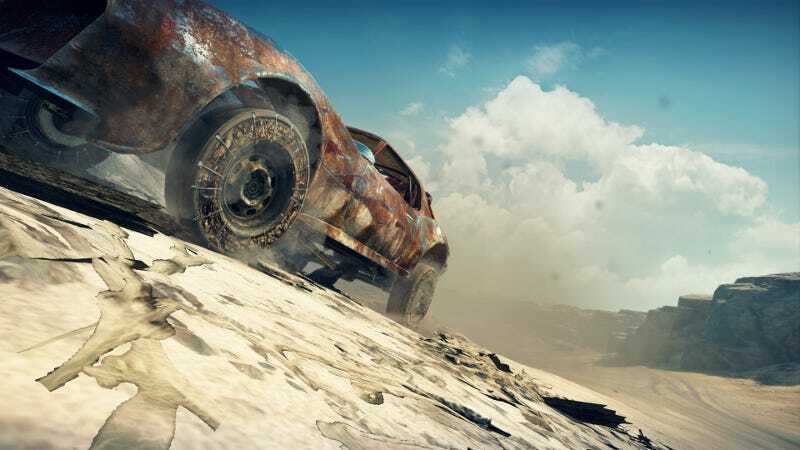 Mad Max is loud and dumb most of the time, but it’s also prone to lulls in action, moments of thunderously bleak beauty. Chilly desert mornings where wind is a faint hint of a whisper and the sun can’t decide if it wants to rise or finally call it quits and start dipping into its billions-of-years-old 401k. Video courtesy of Corey Reeve. Sometimes, a sandstorm will roll in and force me to seek shelter, something many have found annoying, but I actually kinda like. The storms are truly monstrous things; they make me—even as Max, wasteland murder machine extraordinaire—feel small. I can barely see, and all I can hear is furious howling. Such immense natural moments are rare in games. I choose to savor them. At least, until a giant chunk of soaring scrap metal wangs me in the head. Eventually, dudes in spiky cars show up, and I press buttons extra hard to clobber them. Catching their punches, pinning them up against walls and force-feeding them a hilarious number of knuckle sandwiches, ripping armor off their friends’ cars with my harpoon—it’s all so deliciously physical. It feels like I have to manhandle my controller, like anything else wouldn’t be doing the fight scenes justice. That’s the basic loop of most situations I’ve encountered so far: idyllic desert beauty —> dudes (either in cars or not) —> harpoon —> punches in bunches. Predictable? You betcha. Even similarly structured Warner Bros games like Shadow of Mordor and Batman: Arkham Knight had more going on. Right this second, though, I don’t really want complication. Other things are complicated. Life is complicated. Work is complicated. Mad Max has become the milkshake that helps me wash down the day. It’s a nice thing to have. 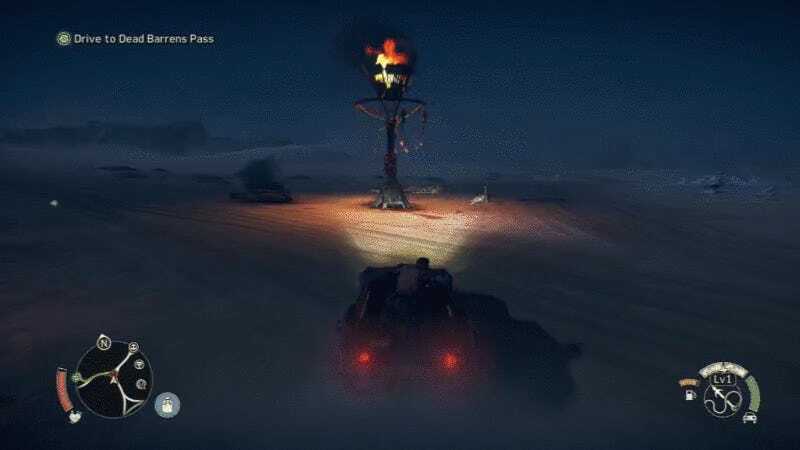 Disclaimer: Mad Max: The Game very rarely feels like Mad Max: Fury Road. And truly, it’s a case of wasted potential. 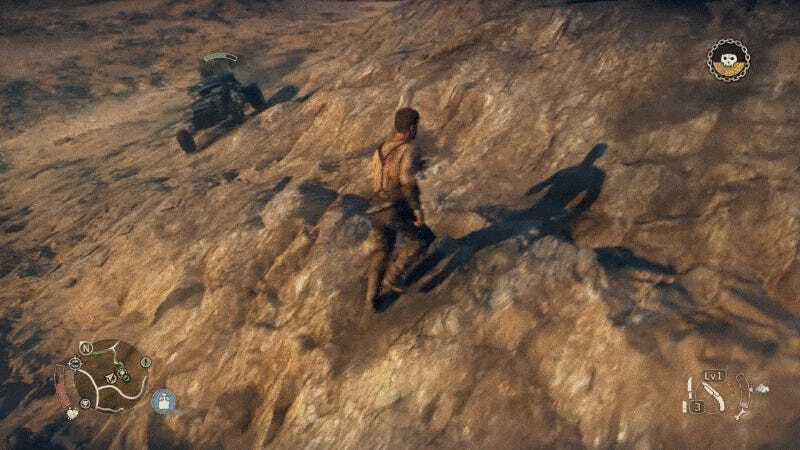 Can you imagine a Mad Max game in the Uncharted mold—tight pacing and cinematic scripting with oppressively thick tension and subtlety to match? If only, if only. It really does look like a scene from Fury Road, albeit completely un-scripted. Any time I sight cars on the horizon, I go first-person. I don’t care if it puts me at a disadvantage. Being stuck in a screaming metal deathtrap, getting crushed on all sides and physically flinching each time a tiny tank pings off my scrap shell—it’s a thrill. Maybe I’ll tire of it in time, but not yet. If I survive, I get to take my revenge. With the Magnum Opus up and, er, belching again, I start ripping drivers out of their vehicles with my harpoon. Some flee. Sometimes I give chase. Other times, I just watch them run. 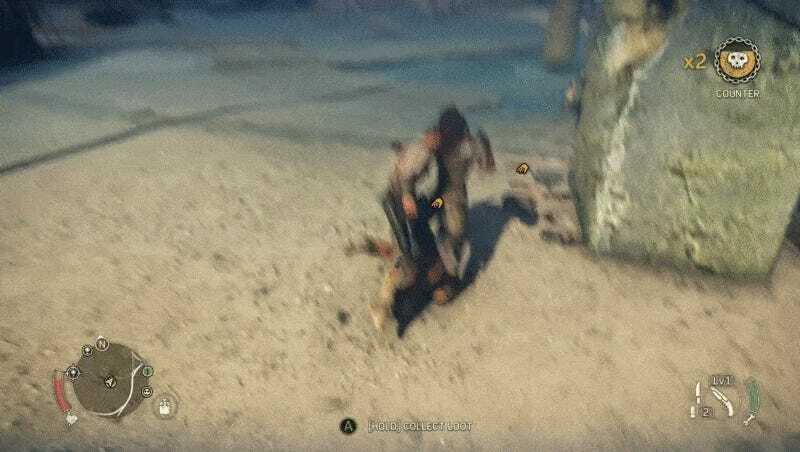 I’ve heard, however, that Max’s situation becomes markedly less desperate as you upgrade the Magnum Opus and Max’s own abilities, turning him from scrappy, Fury-Road-style nobody into video game hero badass du jour. That makes sense, but it also sounds like it’ll strip Mad Max of the parts I love, swap out the rusty rough edges for polished chrome. For me personally, that’s unfortunate. So I’ve taken to upgrading sparingly. Some upgrades are required, but I’ve found that I can rove around destroying increasingly tougher baddie bases—taking out their sniper towers, dismantling their defenses inside and out—without making Max too powerful. It actually makes the game kinda hard! Picking apart each base smartly feels more Mad Max to me than slowly morphing into a demigod. Every base presents itself as a unique challenge, forcing me to dig deep into my resources and get clever. One time I found myself completely overwhelmed by enemy numbers—bruised and bleeding, one solid shot away from death—so I ran outside the base to my car. I got in, fully prepared to flee, only to notice that everybody had followed me to their sand-strewn front porch. That’s when I decided to go bowling. Revenge bowling. Oh what I’d give for a good nemesis system to raise the stakes even more. Damn. The in-game photo mode is a nice touch, too.